Thank you for everything, Barry. As you said, it only seems impossible. But we're sure going to miss you. Been there ... never done this! The ultimate goal of the International Lunar Research Park (ILRP) is to establish a permanent human presence on another world in a manner that provides multiple benefits for humanity. The ILRP is a concept to build through a three phase approach a multi-national, multi-use robotic and human research park on the Moon as an enduring oasis for humanity and as a springboard to advance exploration and development of NEOs and Mars. The ILRP is envisioned to be developed and operated by consortia of space-faring nations, including governments, private developers, academic institutions, and philanthropic organizations, through public-private partnerships. The build sequence begins with a high-fidelity terrestrial prototype on the Big Island of Hawaii that has unique Moon/Mars like terrain, first used for training of Apollo astronauts. The second phase establishes a "lunar robotic village" on the lunar surface, harvesting capabilities in advanced robotics, automation and tele-operations as well as new services and capabilities of commercial space companies. This robotic village will construct and establish the infrastructures and capabilities needed to support a variety of lunar facilities and activities, including those needed for human occupation. The third phase is the full build-out of the ILRP for human accommodation along with its accompanying Lunar University -- the first facilities of higher education on another world. The International Space Station is the existence proof that a multi-national project of the scope of the ILRP can be accomplished. The Apollo Program is the existence proof that the core of an ILRP can be implemented in ten years, with improvements and new facilities added over time. The benefits that have accrued because we sent people to the Moon provide the existence proof of why we should go back with 21st century technologies and many more minds. The Moon is the closest place where we can learn to operate, live and prosper on an extraterrestrial world. Didn't President Obama rule out sending humans to the Moon? This quote also provides the preamble to President Obama's National Space Policy. “Now, I understand that some believe that we should attempt a return to the surface of the Moon first, as previously planned. But I just have to say pretty bluntly here: We’ve been there before." We would agree. We have been there before. And attempting an Apollo style program to go back again would not serve the country well. "To develop the capabilities for people to work and learn and operate and live safely beyond Earth for extended periods of time and even indefinite." Moreover, going back a fundamentally new way, as proposed by ILRP, is something importantly new. Envisioned as a multi-national public/private partnership pursuing multi-purpose activities, the ILRP will provide important new capabilities for commerce, science and research, while also putting in-place the flexible path foundation for extending human presence to NEO's and Mars. The ILRP we believe would serve the country and the world extremely well. Simply put: "Been there ... never done this!" What will the ILRP cost? The ILRP will pursue a multi-national public/private partnership to share the costs, risks and benefits among the participating partners, through a three phase build approach. As the ILRP is in early-stage formation, it is not yet possible to answer the question of specific costs for potential partners, including state or federal governments. However we can say that development of the ILRP will be paced to match the combined resources secured by the participating partners. This way, no single organization will be over burdened. In addition, the ILRP will use a technical strategy that highly leverages developments in advanced robotics, automation and tele-operations -- capabilities which have improved by orders of magnitude since the time of the Apollo program. Commercial space services and capabilities will also be employed to a maximum degree, such as partnerships with companies pursuing the Google Lunar-X Prize and emerging commercial space industries. This approach should significantly lower overall costs compared to those encountered for the historic, US government funded Apollo program. Yes. The key conclusion of the ILRP Exploratory Workshop held April 5, 2011, which included leading national and NASA technical experts on human space exploration have concluded that a permanent human facility on the Moon requires no significant new technologies. Certainly none on the scale that were required to achieve the goals of the Apollo missions. The principle challenge is amassing the required initial resources to begin serious activities, while establishing an effective development path that provides continued economic benefits to the participating partners along the way. Similar to the development of the Internet, the ILRP could be a critical organizing concept and activity that will lead to dramatically improved future opportunities for the country and the world. 21st century jobs, along with new products for a global market, and new solutions for global challenges. The process of building and operating permanent facilities on the Moon will accelerate advances in IT, tele-operation and robotics while organizing them into very capable tools. Spinoffs from these efforts and activities will readily be translated to many terrestrial applications. Extreme green. The types of technologies that can support a group of people on the Moon were there are few indigenous resources to support life are the kinds that can be made into marketable products to deal with increasing environmental pressures from Earth's expanding population, at a time of global climate change. Examples of technological advances include: life support, water reclamation, waste management, high efficiency hydroponics and agriculture, power generation, storage and distribution, and many others. International collaboration. The ILRP, built through the contributions and collaborations of many nations, promotes the type of world community that benefits humanity. Because all the people of Earth can see the Moon, it can serve as a tangible symbol that no tyrant can erase of what humanity can accomplish if we work together in peace. Accelerated timetable to destinations beyond. Establishing the infrastructure for the ILRP will put in place much of the required capabilities for human exploration and development of NEOs and Mars, and probably earlier than could be accomplished otherwise. As stated in the Augustine Report "By first exploring the Moon, we could develop the operational skills and technology for landing on, launching from and working on a planetary surface. In the process, we could acquire an understanding of human adaptation to another world that would one day allow us to go to Mars." A message of optimism and hope for the future. Something we very much need now at a time when we are struggling to find a way out of an historic economic crisis. We need new solutions, new products, new ideas to fuel a viable and sustainable future. The ILRP float all boats. Transition from a space faring nation to a nation of spacefarers. We need more minds, eyes, and fingers in space to reap the vast untapped potential that space offers. This in turn will fuel new discoveries, new industries, and new opportunities for economic growth. Transforming Discoveries. On the day he died, one of history's greatest explorer scientists, Baruch Blumberg, a man who literally saved millions of lives, made the following observation in his keynote address at the International Lunar Research Park Exploratory Workshop. "We've identified a number of worthy reasons to establish a research park on the Moon. But the real value in it is the one we haven't mentioned, because we don't know yet what it is." ... the development of a new world cannot be constrained to just one purpose. For example ... the first men on the Moon. The 21st century could give us the always. We will always have people living and working beyond Earth. We will always be expanding outwards. at each new destination along the way. The 20th century opened the space frontier. In the 21st century, we can live in it. See Jeff Greason's excellent speech at the 2011 International Space Developers Conference on the role of the Moon in the exploration and development of space. NASA and Hawaii have agreed to collaborate on a wide range of activities to promote America’s human and robotic exploration of space. The partnership also will contribute to the development of education programs and foster economic opportunities including new, high-tech jobs. Hawaii Governor Neil Abercrombie and NASA Associate Deputy Administrator Rebecca Keiser signed a two-year non-reimbursable Space Act Agreement Annex during a ceremony today in Honolulu. The ceremony was held on the 50th anniversary of President John F. Kennedy’s historic announcement committing the country to land an American on the moon and return him safely before the end of the decade. The annex establishes a partnership between NASA’s Ames Research Center at Moffett Field, Calif., and Hawaii to explore and test new technologies, capabilities and strategies supporting America’s space exploration and development goals. Under the agreement, Hawaii is proposing to explore development of a ground-based international lunar effort. It would use the state’s unique moon/Mars analog terrain to enable development and testing of advanced automated and tele-robotic vehicles. Researchers would benefit from Hawaii’s natural geography to study in-situ resource use, advanced communications, power generation and other technologies required for exploration beyond low Earth orbit. Participants included Nobel Laureate Baruch Blumberg, Apollo Astronaut Buzz Aldrin, venture capitalist Steve Jurvetson, Tetris video game designer and entrepreneur Henk Rogers, Silicon Valley entrepreneur and author Tom Steding, President of the Space Tourism Society John Spencer, International Finance Lawyer Howard Hawkins, Make Magazine founder Dale Dougherty, National Academy of Engineering scientist Edward McCollough, Director of the Office of Aerospace Development State of Hawaii James Crisafulli, Chair of the AIAA Commercial Space Committee Bruce Pittman, NASA Director of the Innovative Partnerships Office Doug Comstock, Manager of NASA Lunar Commercial Spacecraft Rob Kelso, NASA Inventor of the Year Dan Rasky, Director of the NASA Research Park Michael Marlare, NASA Chandra X-Ray Observatory Manager Tony Lavoie, Lunar and Planetary Institute Scientist Paul Spudis, former LEAG Chair Clive Neal, among other exceptional thought leaders from within and outside the space program. Those interested in competing for funding to develop technologies important for the exploration and development of the Moon and other deep space assets are encouraged to propose to NASA's Broad Agency Announcements from the Office of the Chief Technologist that can be found here. See the sidebar on that page for the relevant links. Some proposals are due as early as May 2011. The Japan-U.S. Science, Technology and Space Applications Program (JUSTSAP) held its annual symposium November 14-18, 2010. See Report. This historic meeting focused on developing a critical path toward building sustainable robotic and human settlements beyond low-Earth orbit, especially in ways that could enable a permanent human presence in space – a strategic goal set forth in both President Obama’s National Space Policy and the 2010 NASA Authorization Act. Over four days of deliberation, they formulated a vision for an International Lunar Research Park (ILRP) that would align common space-exploration goals with complementary resources and capabilities among nations worldwide to substantially reduce the costs, enhance the benefits and accelerate the timetables for future space missions. JUSTSAP 2010 evaluated both the benefits and feasible approaches to establishing a multinational research park on the Moon that would be developed and operated by a consortium of space-faring nations from around the world. The symposium delegates included leading scientists, engineers, educators, business leaders and government officials from NASA, JAXA, private industry, and universities in both Japan and the United States. The proposed international Lunar Research Park would be implemented in three phases, beginning with development of a terrestrial prototype for a multinational lunar base, established in Hawaii through the Pacific International Space Center for Exploration systems (PISCES) at the University of Hawaii at Hilo. The PISCES analog site would utilize the unique terrain on the Big Island (which closely simulates lunar soil, or “regolith”) to test and evaluate innovative robotics, energy, communications, resource utilization, and other technologies required to establish and sustain long-term settlements in space. Phase 2 of the ILRP would focus on implementing a robotic village on the lunar surface – building upon unmanned missions currently under development at NASA and other space agencies, as well as commercial efforts championed by Google Lunar X-Prize contestants and other entrepreneurial ventures. Robots in the village would be teleoperated from Earth, and provide a unique capability for scientists, educators and students to explore the lunar surface and conduct groundbreaking experiments. Phase 3 would include the full build-out of sustainable robotic and human modules on the lunar surface, including a platform for atmosphere-free observations of our Earth, sun and other planets within our solar system; comets and asteroids that potentially could strike Earth; and galaxies at the very edge of the universe. These modules would also facilitate mining of the lunar regolith to spur space commerce, an outpost for media to enhance public awareness of the benefits of space exploration, and a destination for space tourism. Public benefits will accrue from the initial activities on the ground and throughout all phases of development. This will be the largest collaborative multinational robotic project ever undertaken, and the advances expected in IT and robotics alone will serve the participating countries well. This is how the Earth/Moon system looks from Mars. 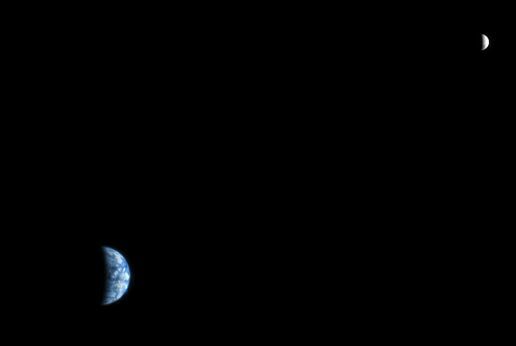 The image above of Earth and the moon was acquired on October 3, 2007, by the HiRISE camera on NASA's Mars Reconnaissance Orbiter. To facilitate the design, development, and implementation of the ILRP, as well as help formulate other highly promising multinational space initiatives, JUSTSAP will be expanded over the next year into a Pacific International Space Alliance (“PISA”). The ILRP will be a focus of the Pacific International Space Allicance conference which will be held November 13-17, 2011 at the Hilton Waikoloa Village on the Big Island of Hawaii.